'Shielded by my own obscurity, and by the lapse of years, and a few fictitious names, I...will candidly lay before the public what I would not disclose to the most intimate friend.' Thus proclaims the novel's protagonist, Agnes Grey, in the first paragraph of the novel of the same name. Author Anne Brontë is often over-looked by modern readers, and I must admit to being such a one, until now. After spending a weekend reading her first novel, I can easily declare that she is a writer equal to, and deserving of, the admiration often only the preserve of her sisters, Emily and Charlotte. The story recounts the experiences of Agnes Grey, the novel's narrator, who indeed, 'candidly and honestly' relates her experiences as a governess in the North of England. And here is where Anne Brontë differs from her sisters, in the veracity of her tale. 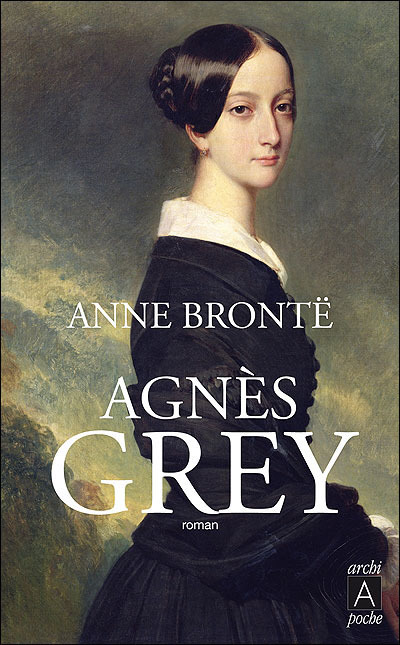 Not that Wuthering Heights or Jane Eyre lack truth or insight, but rather Agnes Grey reads more like a piece of non-fiction than fiction. Anne Brontë spent five years working as a governess, a fact easily gleaned from the pages of her book. She presents the reader with tiny details of the daily activities, fears and responsibilities of one who lived among her employers, but not as one of them. At the outset, Agnes declares that she wants to be a teacher, to influence the minds of her pupils and direct them in the ways of good behaviour. But she fails to foresee how she will be perceived in the eyes of the families she will administer to. Repeatedly, she is regarded as little more than a servant, her own needs and desires playing second fiddle to the whims of her selfish charges. In this way, the novel contains a sense of injustice that is in common in the books written by her sisters. It is clear that the events that she relates are based on fact: the arguments at the homes of her employers, their treatment of one another and herself too, all sound so real as to be better placed in the genre of autobiography. There is one scene, in particular, which tells of a disagreement between husband and wife over the quality of the beef supper. Mr Bloomfield declares that the meat is too tough. Mrs Bloomfield retorts that the cook is to blame. He counters that she cannot be much of a wife if she leaves all such domestic matters to the whim of a mere cook! Despite all his complaints, he still manages to eat a few mouthfuls. I like to believe that Brontë was inspired to write this scene by the memories of a real event and I take even greater delight in imagining how the man and woman in question, Anne Brontë's former employers, must have been so scandalised and horrified to read of themselves in the novel by their old, hopeless, governess. Little did they suspect that the world would soon learn of their selfish pettiness. The first few chapters do not read like a novel at all, but a diary. It is not until she leaves the Bloomfields and moves to a situation some miles from her home place, that the book takes on the tones of a novel, in the truest sense. Agnes's mother seeks out a position for her daughter in the upper classes of society, and so our heroine goes to live with the Murray family. At Horton Lodge, she mixes with the very wealthy and discovers that here too, people think very little of paid subordinates. She is chaperon and teacher to Miss Rosalie Murray and her sister Matilda, both of whom have little interest in learning. While one sister prefers the company of grooms and curses like a trooper, the other delights in teasing local, respectable men, with her tantalising beauty and winning ways. Agnes's plainness and honestly come into even clearer focus when in their company. What I find so moving about this piece of prose is how it relates to Anne Brontë in real life. What a tragedy to know that none of life's little pleasures came true for Anne, nor her sister Emily either. They did not find love, were not married and did not bear children. Indeed, they never found independence in a home of their own. One can see from this passage how desperately Anne desired these simple things. Her interest in the position of women in Victorian society is clear from the plot line of the novel. It begins with Agnes's mother, Mrs Grey, who turns her back on a privileged life, for the sake of love. Agnes relates that her mother, 'would rather live in a cottage with Richard Grey than in a palace with any other man in the world.' But the story goes on to relate how the daughters of Mrs Grey were the ones to bear the brunt of such a decision, having little income to live on as they got older. Then Brontë considers the plight of the wealthier women in society. Mrs Bloomfield is ignored and disparaged by her husband in turns, for being a bad mother and a woeful housekeeper. Mrs Murray has little sway over her daughters behaviour, but it is her daughter Rosalee's fate, that Brontë plays particular attention to. The author notes how Miss Murray's only desire is to be mistress of Ashby Park, caring little for her husband, Lord Ashby. Her mercenary feelings on the subject of marriage ultimately come back to haunt her. She indeed does come to live at the great house, but is imprisoned there by her husband who distrusts her flirtatious temperament and is fearful of scandal. Here is the sentiment at the heart of the entire novel: Brontë is trying to teach, to instruct, and the moral she means to impart is that women do have choices to make, however limited they might be. Where Austen might say, 'by all means marry for love, but take care that you marry a man of good fortune', Brontë seems to believe that marrying for love is the right thing to do, and that monetary cares will not be so burdensome when shared with those you love. Brontë has also much to say about beauty in this text. She states unequivocally that the doling out of beauty to one person, but not another, is a fact of life, and that there are clear advantages to being so well-favoured. And then she makes a moving plea for the case of one not blessed by beauty, using the metaphor of a glow-worm to press her point. This description of a woman passed over because no one noticed how much love she had to give, is all the more poignant because we know that Anne Brontë was just such a woman. She never got to show the love she had the power to bestow, never got to 'make her presence known'. This novel is no mere tale of a slighted governess, bitterly revealing the scandals and secrets of past employers. No. It is a very thoughtful, thought-provoking book about family, love and the desire to live a full and honest life. Is not that something we all can relate to? I urge you to read this wonderful, wonderful book, if for nothing else but to let the words of Anne Brontë not go unnoticed, and to redress the neglect of such a fine writer who has gone uncelebrated for far too long. Labels: Agnes Grey by Anne Brontë, Bronte Classic, Governess, Victorian Literature.